It’s no small feat to own your own car. While a car of your own is an indispensable tool, any four-wheeled vehicle is, essentially, a giant gaping black hole into which you constantly pour money. 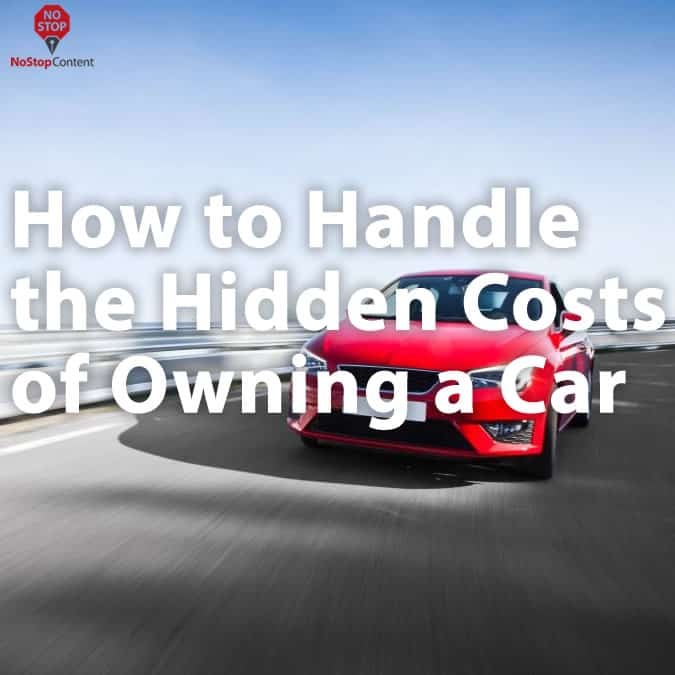 While it may seem like managing the constant hidden costs of owning a car is impossible, there are ways to get a handle on them – here are a few of the most important things to keep in mind. Most people assume that the cost of owning a car is primarily in the form of the vehicle’s price tag, along with keeping it insured and keeping the tank filled. The truth is that the average annual cost of keeping a car can be much more than you bargained for! Insurance – up 9.6 percent from 2015, paradoxically due to lower gas prices. Cheaper gas leads to more time spent driving, which translates to a higher likelihood of accidents. Depreciation – up 2.87 percent as more used and off-lease cars enter the marketplace. A greater supply of used vehicles lowers resale prices, reducing the value of your own car in the process. Maintenance – up 3.33 percent as newer vehicles require more thorough maintenance. This manifests most often in the form of newly-designed synthetic motor oils that are much more expensive than traditional motor oils. License/Registration Fees – up 3.31 percent, thanks to the ever-upward creep in vehicle prices. State and local tax rate hikes also play a large role in making it more expensive to register your vehicle or renew your license. Finance Charges – up 2.09 percent, again as a result of increased registration and tax rates. These costs are often rolled right into auto financing to make it more convenient for car buyers. Tires – up 2.04 percent since 2015. The cost of a good set of tires is likely the most stable thanks to healthy competition in the marketplace. Overall increases can be attributed to general inflation. With so many variables at play when it comes to the cost of keeping a car, it seems almost impossible to plan out a strategy for managing those costs. While some things you can’t control – like tax rates and registration fees – there are targeted ways to cut back on your vehicle costs. The trick is knowing where to cut back, and how. The trick is knowing where to cut back, and how. Focusing on just one or two areas – insurance and maintenance, for example – can lead to significant savings overall, leaving you room to cope with the increased costs of other factors. Insurance costs in the United States can be eye-watering. According to the Insurance Information Institute, the National Association of Insurance Commissioners say that a year’s worth of car insurance coverage for the average American is $866.31 – the highest it’s been since least 2005. And don’t forget that’s an average – depending on your age, your driving record, and where your live, average annual rates run from as low as $571 in Idaho to $1263 in New Jersey! In this sort of landscape, getting a deal on car insurance is entirely dependent on finding an insurance company that’s willing to offer you more coverage for less. Spending time comparing quotes can be beneficial if you can find an insurer willing to offer you the same cover you have now at a lower price – or even better cover for the price you’re already paying. More cutting-edge insurance companies even offer technological options, like Progressive’s Snapshot telematics-based monitoring, which records how safely you drive, offering you discounts for not accelerating or decelerating too quickly or for taking corners safely and carefully. Nobody likes taking their car in for regular tune-ups and oil changes, but in this case, an ounce of prevention truly is worth more than a pound of cure. In fact, recent research conducted by the Car Care Council, a division of the Auto Care Association, found that 89 percent of cars on the road today need at least one service or repair. Putting off routine maintenance might seem like a way to save money. In the short term, that might even be true. The problem is that doing so consistently amounts to little more than a false economy; the money you save by not taking your vehicle in for routine maintenance, like oil changes and new air filters, can come back to haunt you if more serious (and more expensive!) problems develop as a result. Do yourself a favor and get your preventative maintenance done on time. If you need more information, be sure to consult your car’s Owner’s Manual for a suggested maintenance schedule. Nobody ever said that owning a vehicle was going to be easy. While there are a number of costs associated with keeping a car on the road, not all of them are out of your control – taking the time to manage your costs now can help to keep them as low as possible in the future.